This is to inform you that the next LAA meeting will be held on Tuesday, May 14, 2019.The meeting will be held at LaRC in the NACA room in the Building B2102. Attention all LAA Members: The LAA Board has mounted an effort to update the LAA By-Laws to reflect how the organization is being run. Most of the amendments are relatively minor or editorial but some, including how LAA Dues are established and may be used, are significant to enable the LAA Board to efficiently conduct LAA business. All of these changes have been reviewed and are supported by the LAA Board, however, per Article IX of the ByLaws amendments to the ByLaws must be presented to the LAA membership at the Annual Meeting and voted on by the Board of Directors at their first meeting following the LAA Annual Meeting. Please review the updated By-Laws HERE. The latest LAA meeting of 2019 was held on Tuesday April 9 in the NACA Room and the turn out was excellent. Roger Ferguson, LAA Vice President, introduced the speaker for the meeting, Dr. Leroy P. Gross, MD, MPH. FACPH, FAsMA, the Center Medical Officer of NASA Langley Research Center, Hampton, VA and CEO and Founder of InoMedic Health Applications, Inc. The title of his talk was “Some Pearls on Quality of Life after Retirement” The talk was well received by the attendees. Minutes for both the LAA General Meeting and Board Meeting are contained in the Meeting and Minutes section. Please include your legal first and last name as well as a telephone or cell number and state that you are requesting a six-month LAA badge renewal. Call the Badge and Pass Office at 757-864-2790 within a week after you receive notice that the renewal is being processed and to ensure your new badge is ready for pick-up. 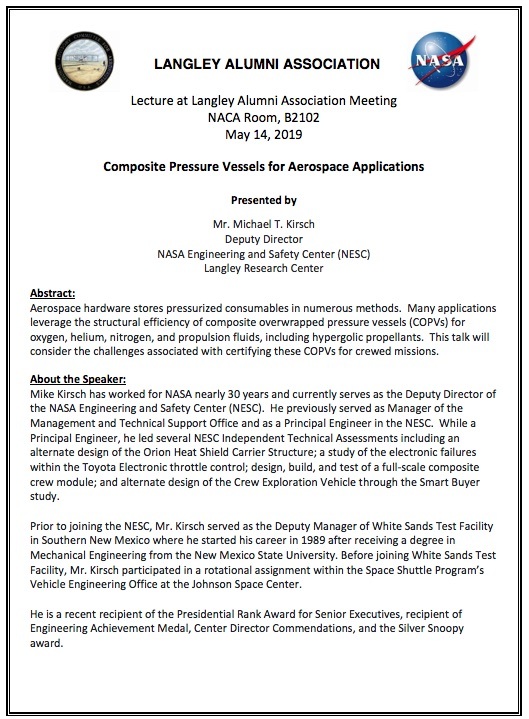 The LAA has a close working partnership with the NASA Langley Research Center. Our liaison to NASA Langley Research Center is the talented Melanie Robinson, and she can be reached at 757-864-2660. melanie.l. robinson@nasa,gov. The Langley Research Center NACA and NASA Hall of Honor (HoH) is an important partnership between the LAA and LaRC to honor the pioneers and contributors to LaRC over the years. The permanent display of the Honorees at LaRC for Classes 2015 and 2017 has been completed and can be viewed in the NACA Room of the NASA Langley Cafeteria, where the LAA meets. This is an exciting accomplishment of the LAA and NASA Langley Research Center partnership and praise for the outstanding effort of the Langley Graphics team. You can find more information about the 2015 and 2017 classes at the NASA LaRC Hall of Honor website. The LAA Board has established a new ad hoc committee entitled Langley Retiree Knowledge Capture (LRKC). It is well known that LAA retirees have a vast reservoir of past experience and expertise that may need to be accessible to Langley, other NASA Centers, and even outside organizations. This sub-committee has been appointed by the Board to explore this matter and to define what the scope and organization of the effort would be if the LAA undertakes the task. Members of the sub-committee are Marilyn Ogburn, Rob Calloway, Dan Palumboand Wayne Richie and will be reporting their findings to the Board at future meetings. Meanwhile, all members of the LAA are encouraged to contact any member of this sub-committee with any ideas or suggestions (the primary point of contact is Marilyn Ogburn (meogburn2@cox.net). The LAA Board is continuing to pursue information on spousal benefits. LAA Board will work with Melanie Robinson to acquire the necessary information. There is an excellent series of monthly lectures available to the LAA membership. The Colloquium is presented in the LaRC Reid Center auditorium at 2:00 pm and the same or similar Sigma Series lecture in the VASC at 7:30 pm. Please visit Colloquium and Sigma Lectures for more details including the upcoming topic. To keep up with activities at the NASA Langley Research Center visit the NASA Langley Website. NASA Langley provides an excellent website on public cultural resources at the Center. Please visit Public Cultural Resources. The Federal Employee Health Benefits health plan brochures are available online at this link.